I love the beginning of a new month. 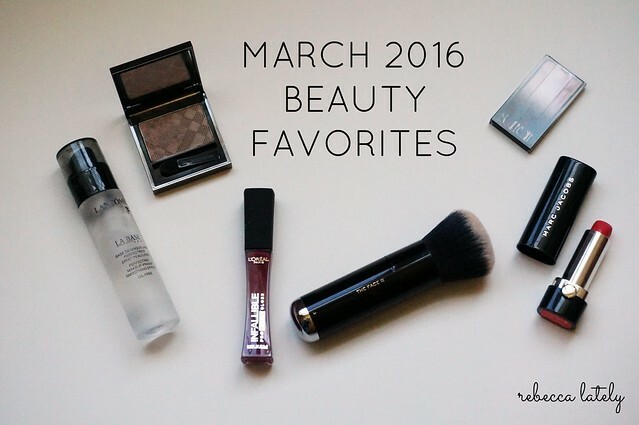 It’s time to remember all the makeup and beauty items that I loved during the month of March! To be honest, I used the same makeup practically the whole month, so these are the highlights. My makeup look for the entire month was super simple, except for a couple of lip products. Here is what I’ve been loving? I am using up some older (but not too old) primers, so I rediscovered this long time favorite. I first tried this primer in a sample, and I instantly knew it was perfect for my skin. If you need a primer to keep your makeup locked on your face all day, this one is amazing! I took a chance on this eyeshadow back in December. I am nowhere near any Burberry counters, so I ordered this blindly on Sephora trusting all the rave reviews online. Well, the reviews didn’t lie. This eyeshadow is not only a beautiful color, but it literally lasts all day without creasing. I have not found an eyeshadow that performs as well as this one. It is definitely worth the money! I did a review of these glosses in March, and this color has been in my purse quite a bit. This color is Forbidden Kiss. It’s a gorgeous berry color. If you want to read my full review, it is here. But, long story short, these are a matte lip gloss that stays put so well. They are very pigmented and comfortable on the lips. This was another ‘trusting the internet’ purchase. I have the Marc Jacobs Re(marc)able Full Cover Foundation, and this is the brush that is recommended for it. I bought the foundation first and have been wearing it here and there for a month or so. Last month, I read that this brush actually buffs in the foundation so well. I had to try it out for myself, and it is so true. I also use this to blend in concealer and other foundations (not just the Marc Jacobs one). This is the nicest foundation brush I own. It’s so soft! This was in my spring blush round up and, ironically, it looks amazing with the L’Oreal gloss in Forbidden Kiss. This blush is a gorgeous, rosy mauve in the softest formula I’ve ever used. It blends so well, and I can wear it sheer or layer it to be darker. I think my favorites have been very Marc Jacobs heavy lately, but the brand has seriously impressed me. This was my first MJ purchase, and it’s still one of my favorite lipsticks. This is a gorgeous coral color. This lipstick stays on your lips forever and does not transfer to my mug. For being so bright, it really is gorgeous. It’s not garish at all, and I imagine this would look gorgeous on a lot of people. For this month’s beauty favorites, I’m giving away one Burberry Wet and Dry Shadow in Pale Barley. I will be including some of my favorite eyeshadow brushes as well! Use the widget below to enter, and good luck to all!